Looks great, they will love it. I love it, looks great. I am finishing up a tumbler, just have to add borders, then will do a simple meander on it. Nice! The mixture of floral and plaid fabrics is really neat! Your quilting on the border is lovely. That looks very nice - you're doing a good job! I love tumbler quilts I am currently working on a large one now. Yours is perfect! Very nice mix of scraps. I like it! Nice quilt. Like that it will look good for many years. A classic. 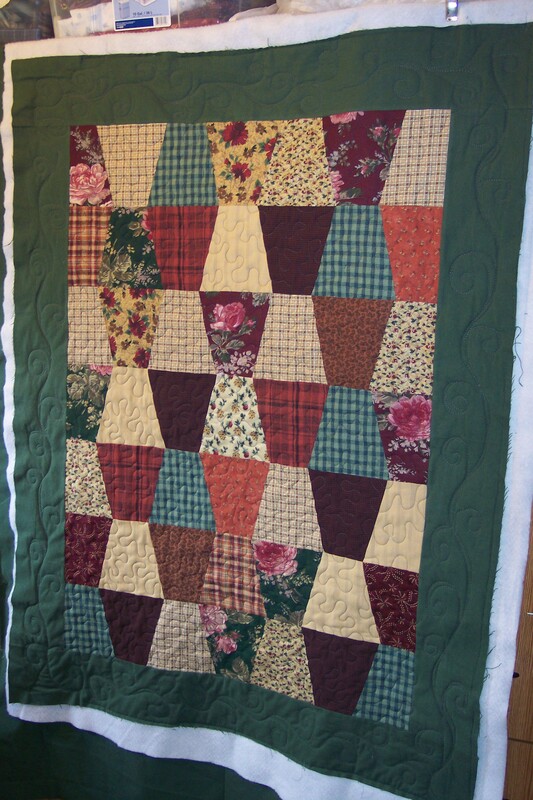 I just saw a picture of a tumbler quilt and I may try it one of these days. Every other row uses the bigger tumbler size while the alternating row uses two rows of the smaller tumbler size (AccuQuiltGo has the dies for both sizes). Hope it makes sense. Turned out great, they should be very pleased. Really like how you mixed floral with plaids! Did you use the small or large tumbler? Looks good to me, love the tumbler pattern. Great Charity quilt, this will keep someone nice and warm! Looks good to me! I'm sure some kid will love it and feel the comfort it brings! Love your quilt. I am wondering what size your tumblers are. They look larger than usual, but not sure if that is just an effect of the photo. Great quilt. Looks like one my grandmother would have made, and she was a quilt genius imo. It's more than OK - it's great. This is another one going on my "quick list" from the board this week. I already have one with small squares all over with l-l/2" sashing almost finished for my GGD's birthday coming up in a couple of weeks. And was looking at one of my magazines last night, and saw this pattern and thought to myself "that is a good one to try after I finish doing this one I am working on now." The only thing, I don't know how to "archive" and I had a hard time finding that post when I got ready to start the quilt a couple of days ago. Make every day count for something! Good job. Border scrolls are great. Terrific quilting, and nice selection of fabrics!